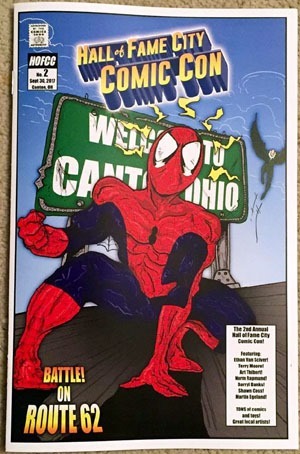 Saturday, I attended the Hall of Fame City Comic Con, held in Canton, Ohio. I’m not sure when, exactly, they got on my ‘radar,’ though I think they might have been a Facebook ad (one of the astronomically-rare few to be properly, successfully "targeted," but that’s another story). After being thoroughly burned on the NEO Comic Con, I wasn’t entirely sure what to "expect" from this one, and very nearly opted not to go. But since I had pre-ordered a ticket, I figured it’d be silly not to, even if I walked in, did a quick walk-around and walked back out. Going in, two of my main "goals" were to meet/get stuff signed by Norm Rapmund and Ethan Van Sciver. I also wanted to find a bunch of Savage Dragon comics on the cheap. And find some good deals on collected volumes that weren’t just the same old boring/repetitive mix of $10 Marvel hardcovers and SKINNY TPBs. 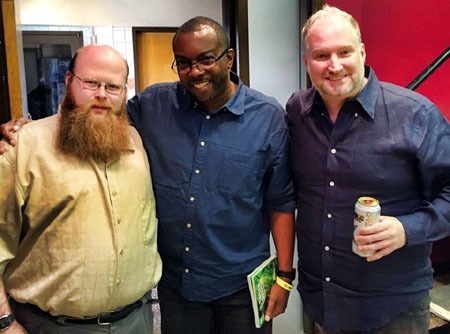 Finally, there was a Green Lantern panel scheduled with both Daryl Banks and Ethan Van Sciver that seemed likely to be interesting (Banks was the artist of the fall of Hal Jordan; Van Sciver was the artist on the redemption of Hal Jordan). Plus, it was the only one that seemed to hit me as a demographic, involving any kind of super-hero comics. So…how did this con go? 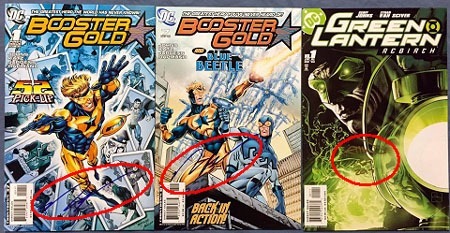 I had three Booster Gold issues with me to get signed by Mr. Rapmund. I wound up sticking with two, though…but could easily had multiple dozens of issues, loving so much of what the man’s done! Then for Mr. Van Sciver, I opted for my "key" issue where I first became really aware of him as an artist–Green Lantern Rebirth #1. Unfortunately, I didn’t have anything with me to get signed by Mr. Banks…something I fully intend to correct in a few weeks if I make it to another con I’m aware of that he’s supposed to be a featured guest at! I happened across a booth with a bunch of paperbacks, and initially figured to be just another one selling a bunch of over-stocked skinny Marvel books. But I spotted a fat, thick volume, and realized that this booth actually had some real QUALITY stuff for its pricing. I regret a couple volumes I passed on, but still wound up with these eight (8!) volumes. I believe the paperback Marvels all have a cover price of at least $34.99, if not $39.99 apiece. 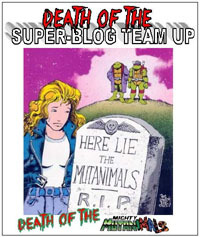 And I happened to notice a $29.99 price on the hardcover The Puma Blues (a title that caught my attention due to recently becoming re-aware of the title thanks to research I did for my Super-Blog Team Up post The Death of the Mighty Mutanimals. It’s by Stephen Murphy and Michael Zulli; long associated with their Mirage Studios work with the Ninja Turtles. 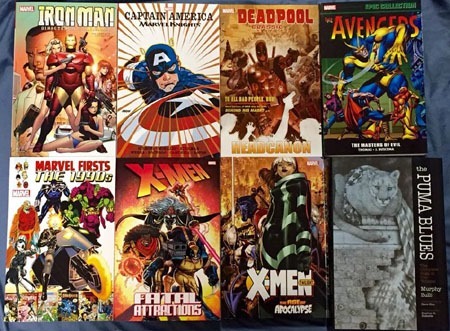 Each of these worked out to a whopping $5 apiece…so I’m kicking myself all the more for those couple of Wolverine books I passed up! After the Green Lantern panel, I headed back out onto the floor, and wound up stopping at a booth with a bunch of Pops because I saw a Swamp Thing, and because of the flow of foot traffic. 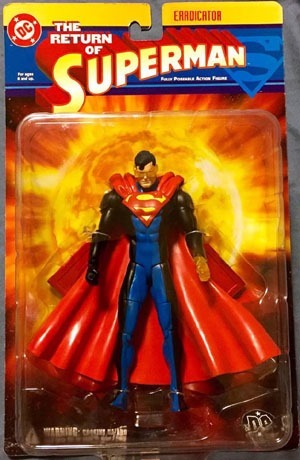 Once I’d looked at some stuff and was ready to walk away…I spotted a familiarly-packaged Superboy, and on further investigation found Eradicator as well as the black-suited Superman. There was no way in heck I was spending to buy all three…so I selected the Eradicator, finding the design a lot more appealing to me, and this is a figure I’ve wanted for quite a long time! Realizing I was blowing my budget, I decided to call it a wrap, knowing anything else I was likely to find would probably put me way over-budget. 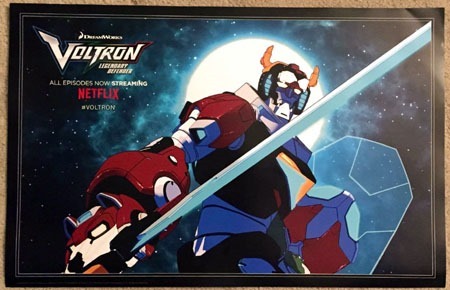 But on my way out, I opted to buy a copy of this "autograph print," for the art and being a ‘souvenir’ of the con, even though I should have bought it on the way in and then made the rounds to get it signed by all six guests. 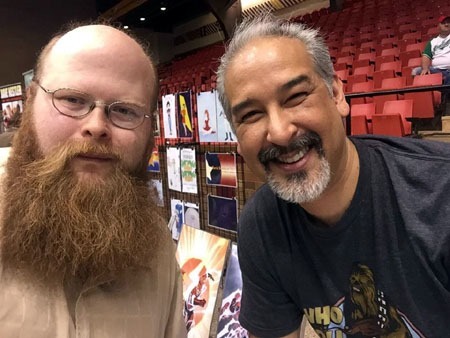 But then, I’m not an autograph hound, and prefer that when I get signatures for comic stuff, it’s the actual comics and they mean something to me. Not "just" some signature on a print for the sake of filling in some blanks. And I assume the sale of these prints help out the con itself, so figured why not? I also stopped back in at an entrance-way table, where as I’d "suspected," there were still plenty of these Voltron posters. I dug the look of this, and didn’t want to be carrying something like it around the whole con…but grabbed it on the way out. On the way home, having had the Pops-spark rekindled a bit for the day, I stopped at a Toys R Us hoping to find the Rafiki figure with baby Simba, but no luck. 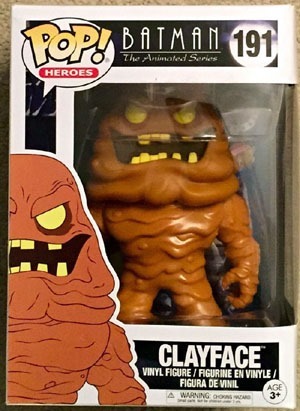 They did have this Clayface, which I’d looked for elsewhere and not seen, and assumed to be one of the oversized figures. Finding it and not wanting to have to "hunt" for it later, went ahead and snagged it! Along with getting those Booster Gold issues signed, also got to get a photo with Mr. Rapmund! 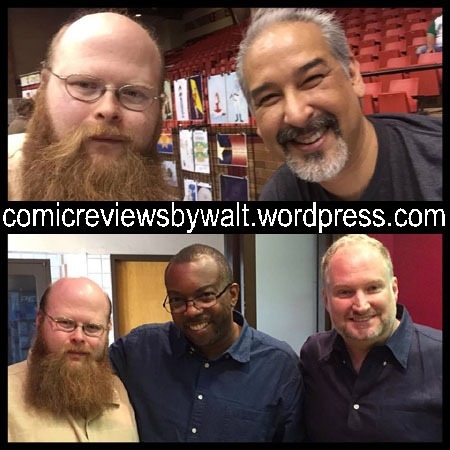 And what I’d "pictured" as just getting a quick photo of the men from the fall and redemption of Hal Jordan wound up with me being in the photo with Mr. Banks and Mr. Van Sciver! 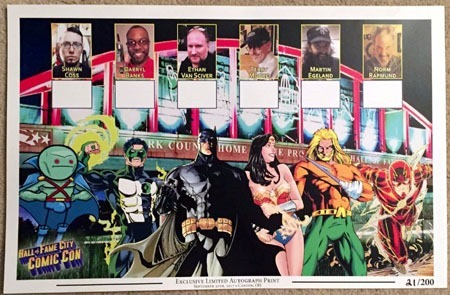 So, all in all…for me, this was about as excellent a convention as I could have hoped for, in going to it alone and not seeing any obvious 25 or 50 cent bins, and being somewhat jaded from other experiences. I am glad I went, and have to say I’m extremely eager to read more of the Green Lantern run Mr. Banks did the art for, and to get a couple things signed by him in November. I definitely enjoyed the panel, generally enjoying hearing favored creators speak about their work and various other things in the "comics industry," and very much enjoyed some of the topics covered in the panel. In its way, the panel itself was practically worth the price of admission in itself! This mini started out billed as a 5-issue series. Then it got expanded to 6 issues. This sixth/final issue comes basically 10 months after #1 shipped. Frankly, the issue–while something I’d like to…well, like…seems to be something that ought to have been wrapped up long before now. Story-wise, we open on Barry and Wally chasing Zoom through time–the latter has vowed to kill Iris, the former are trying to stop him. Of course, the duo catch the villain and ensure he won’t threaten anyone ever again (well, for the rest of THIS issue, at least…it’s a comic. He’s gonna come back!). Then they return home where there’s a parade for Barry…I believe the one he was nervous about way back in issue #1. And what would a re-insertion of a classic character into contemporary continuity be without the “validation” of the Justice League affirming the return and his place with them? 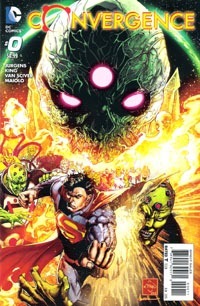 The art for this issue–while good–lacks a certain sense of greatness, and isn’t nearly as appealing as I’d’ve hoped. Perhaps the lateness of the issue would suggest time was taken to really make it pop, or something. Even on a couple of the huge full-page/double-spread shots, I’m not entirely clear what’s being shown, though they make a little more sense when I take time to go back and “study” them, looking for what they COULD be, beyond what simply looking at them AS I read the story gives me. There’s one that I’m not sure if it’s being suggested that this chase through time IS the lightning that gave Barry his powers in the first place (which would seem to be a time paradox), or if they’re just viewing it, or if it’s just there to fill out the page and clue us in that they’ve reached the earliest time OF Barry’s time as The Flash. The story itself mostly ties up the broadest of loose ends, but already sets the stage for not only the return of Zoom to active status, but also someone called “Doctor Alchemy,” who I presume is some largely un-used silver-age Flash villain that’s gonna be raised up to show us how awesome he can be, much as was done with Black Hand in Green Lantern (though I’m not expecting lightning to strike twice, in this case). Johns seems to have a definite love for the character, which I applaud…but this series in itself has done far too little to “sell” me on Barry as the primary Flash character (seems if anything, it’s been Johns using Barry to such good effect with Hal in Green Lantern and the core Blackest Night book that’s sold me at all on the merit of having Barry around. Obviously, if you’ve already bought the first five issues, this issue’s one that you might as well consider picking up for the sake of completing the series. It’s in no way a selling point in itself though for the series, and based on this issue alone I’d suggest ignoring it. 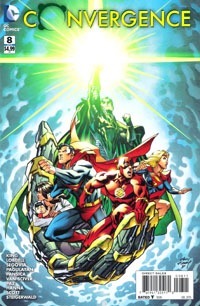 The collected volume will probably read much better, with the wait between issues stretching a mere turning of a page or two rather than months, and the whole of the story will be fresher in one’s head and thus probably feel more coherent. As a whole, this issue’s quite a disappointment, a lukewarm ending to what should’ve been a hot series. The “Rebirth” bit is losing its shine with me here. While expectations have been that the trumpeted return of Barry Allen is the focus of this series–that he’d be restored as Hal Jordan was to Green Lantern in that title’s “Rebirth” mini–my expectations are steadily dropping. This issue sees reaction to Barry apparently interacting with the speed force in such a way that others tapping into it are dying as his body seeks more and more speed power, in an almost vampiric sorta way. While everyone else hustles to figure a way to separate Barry from the speed force–sure, he’d lose the speed, but at least he’d be ALIVE–Barry determines to go his on sacrificial course…one that puts him back in the familiar role of essentially racing Superman. The issue’s ending puts Barry face to face with who the villain of the piece likely is, in a way that also reminds me very much of the Green Lantern: Rebirth series. The story, somehow–perhaps I just don’t want to like it–seems one of the weakest I can think of from Johns. While I’d known Kyle as Green Lantern longer than Hal, I’d still known Hal as Green Lantern first. However, the first real exposure I had to the Flash, it was Wally–and in restrospect, had BEEN Wally for bout 3 years before I owned my first comic. While the situation presented in this story is mildly interesting, I do not find Barry himself interesting…certainly not the way I did Hal. And I make the comparisons given the creative team and the title of this series–obviously meant to BE compared to GL:R.
The art by Van Sciver–ESPECIALLY the cover–is top-notch; I really can’t complain about it. Much as Van Sciver brought in the glowing/projected imagery for the GLs of the Lantern logo, he brings that to bear on the Flash with the lightning. Not that it’s original, but something about it really pops. As a whole, this is a higher quality book than the first couple issues of the post-Bart-as-Flash title that I actually read. It’s not bad for those new to the Flash family of characters (I am myself learning more of the character grouping than I’d known of them prior), so overall accessible to new readers. It’s just lacking a certain excitement and enjoyment factor. With Green Lantern, it felt like the return/rebirth of Hal Jordan mattered. With Barry…it feels like we’re looking for a reason FOR his return to matter. We open with a mystery in this issue, as someone with a tie to or fixation on the Flashes attacks and kills people in the Central City crime lab. As other police storm the lab, the killer–who was gathering certain chemicals–seems to reenact the accident that gave Barry Allen his powers. We then move to a “welcome back!” parade being held in honor of the recently-returned Barry Allen; while those closest to him also revel in the hero’s return. Barry resists the attention and importance placed on his return. When an old foe returns, Barry is onhand to deal with the foe–though what he gets is far from what he expected. The art for this issue is quite good…but somehow for me fails to hold up to my expectations for how much I enjoyed the art on the OTHER Rebirth mini. Very solid stuff here, and you’d be hard-pressed to find much better, though! I’m quite underwhelmed with the story so far. With the exception of a handful of my grandfather’s old comics more than a decade ago, the only instances I’ve ever had reading Barry have been few and far between, with him making brief appearances in Wally’s life…so I don’t know how the characterization holds up (ore doesn’t) by comparison. At the moment, I’m really not interested in Barry, even after this issue, and while the issue’s end leaves me curious as to what’s caused what happened, I can’t help but wonder if it’ll come across more cliched than not. It was Johns’ focus issue on Zoom a few years back that first really drew me into the world of the Flash, and it’s Johns’ Flash that developed any interest I really have in the character–so I’m holding out hope that my interest will develop a lot more as this series progresses. Probably the main drawback of this issue as a whole is that it feels–more than a lot of comics–like it IS a story chopped into segments. If you ReallyHaveToKnowRightNowAsItUnfolds what’s going on, jump on this issue. If you’re just looking for what’s hopefully going to be one of THE Flash stories with great art, I suspect you’ll be better off waiting for the collected volume.